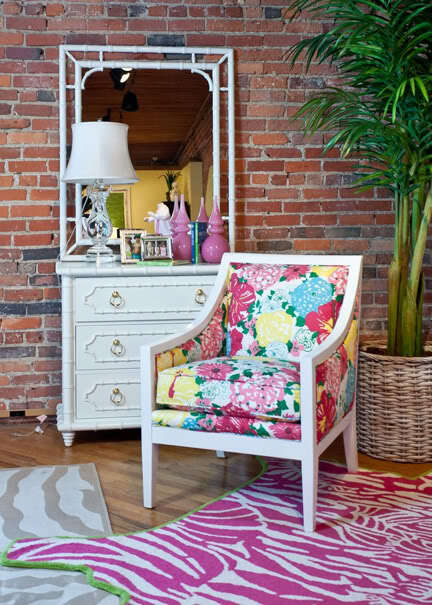 Being from the South, I love Lilly– Lilly Pulitzer, that is! There’s just something about getting back to your roots and remembering where you came from that makes home design that much more special. I grew up in a community with lots of golf and horse races, so that means lots of bright colored dresses. I may not wear tons of brights now, but I often wonder how to translate that happy homey feeling into my home. 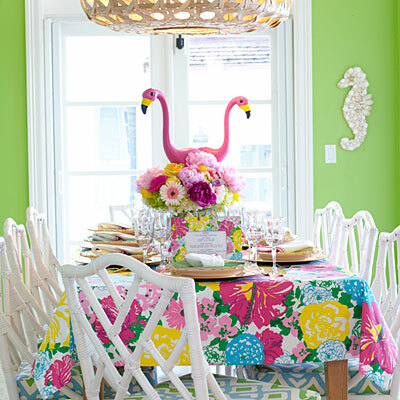 I saw this article in Southern Living about a Lilly inspired lunch, and love the idea of using old patterns for table cloths and decor inspiration. I would love to recover a chair using one of my old dresses- I would even love to find old fabric and make pillows for the living room! The rich color on the walls would be easy for any rehabber to achieve- then you just paint your furniture white and get some bold patterned fabric for the duvet/ pillows. It would be easy to achieve this look for less!